The resolution will be brought before the UN General Assembly next month and is almost certain to be adopted by a similar vote. 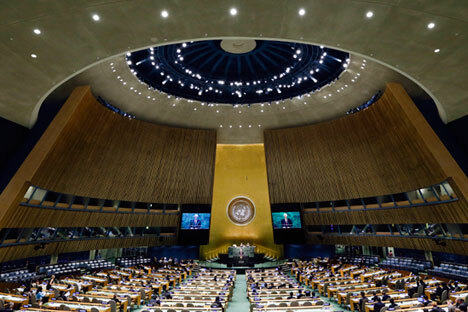 The UN General Assembly’s committee on humanitarian and social issues has passed a resolution condemning the situation with human rights in Crimea. The resolution was supported by 73 states, including the United States, the United Kingdom, Canada and European Union countries. A total of 23 states voted against, including Russia, Armenia, Belarus, Venezuela, China and India. 76 countries abstained. The four-page document, put forward by Ukraine, condemns alleged discrimination and human rights abuses against residents of Crimea, including the Crimean Tatar and Ukrainian minorities. Anatoly Viktorov, the head of the Russian Foreign Ministry’s Department for Humanitarian Cooperation and Human Rights (DHCHR), said at the session of the committee that the resolution "has nothing to do with the real situation in Crimea, as well as the opinion and interests of the peninsula residents." "We are convinced that many Ukrainians would prefer to live like the residents of Crimea live now: in peace, gradual economic development and social security. This is how the present situation in Crimea looks like," he said. Viktorov said the resolution was proposed by "the state where blatant human rights violations have become a routine practice." The document, according to the Russian diplomat, serves as a "yet another example" of how human rights can be turned "into an instrument of a political game."